This photographic collection of traditional wet fly patterns, recipes, and notes, when completed, will contain four-hundred eighty-three flies selected from Ray Bergman’s books. This number was determined by including all the illustrated wet fly patterns from Trout in the first edition and the new wet flies on Plate No. 16 from the second edition. Additional patterns not represented in Trout were chosen from Just Fishing and With Fly, Plug, and Bait to round out this ‘Bergman Collection’ of wet flies. A few wet fly patterns from Trout appearing in the other two books containing significant recipe variations are included here as well. There are many reasons why Ray Bergman’s 1938 book Trout is a monumental angling work. From a publishing perspective Trout owns the distinction of being the only fishing book ever written to remain continuously in print for more than fifty years. Besides the enduring popularity of the book, one of the most significant achievements of Trout is the fact that upon release it presented the largest collection of illustrated fishing flies ever published. Ray Bergman’s friend, Dr. Edgar Burke, who was a surgeon, wildlife artist, and author, meticulously painted fifteen color plates of fishing flies for the first edition of Trout. The first nine plates are exclusively devoted to wet flies and contain four-hundred thirty-five illustrations. Five more patterns on Plate No. 10 raise the combined total of wet flies to four-hundred forty. A selection of nymphs, steelhead flies, streamers, and bucktails on plates ten, eleven, and twelve add another sixty-seven. Lastly, one hundred-five dry fly patterns on plates thirteen through fifteen complete the number of illustrations for a grand total of six-hundred twelve. It is noteworthy that the number of wet flies outnumbers all other types of flies by well-over a two-to-one margin. This preponderance of wet fly patterns is indicative of the popularity of the favored method of fishing at the time. Other angling books may contain greater numbers of pattern listings, but to contemporary wet fly aficionados, Trout, though lacking detailed how-to fly tying instruction, has nevertheless evolved as the gold standard for the study and tying of traditional wet flies due to its unmatched combination of sheer numbers of painted illustrations and written recipes. The alluring beauty of hundreds of wet flies on the Trout color plates, featuring row after row of colorful and fancy, plain and subdued patterns, has captivated anglers and held them spellbound with admiration for generations. Current wet fly nostalgia and interest has resurrected Trout with new life as a primary reference source for those seeking to tie old patterns that have recently achieved rebirth as classic wet flies. Trout was published six years after the 1932 release of Ray Bergman’s first book, Just Fishing. Interestingly enough, written fly pattern recipes are not included in Just Fishing as they are in Bergman’s other books. Fortunately, I had the privilege on two occasions to view and study seven of Dr. Burke’s original fly paintings. His artistry is far superior in person than any of the color plate reproductions of his work published in books, likely owing to limited capability of the technology at the time of publication. The knowledge gained from first-hand observation and examination of Dr. Burke’s original paintings established visual verification of his painting style and technique. This experience advantageously enabled me to better interpret the Just Fishing color plates. Through close scrutiny of each fly painting I was able to analyze, assess, and record the various components accurately. Ray Bergman became the Angling Editor of Outdoor Life magazine in 1934. In 1942 Bergman’s third book, Fresh Water Bass, was published. His fourth and final book, With Fly, Plug, and Bait, was published in 1947. A first edition adaptation of Trout was published in England in 1950; by this time the initial 1938 release had been reprinted thirteen times. The culmination of Ray Bergman’s book writing career occurred when the second edition of Trout was published in November, 1952 in an enlarged version with print revisions increasing content twenty-five percent above the first edition. Trout as originally published is a book entirely devoted to fly fishing, but considering Bergman’s well-rounded angling column in Outdoor Life, the 1952 edition featured two chapters on spinning, a new method of fishing facilitated by the invention of nylon monofilament line that was invented in the 1940’s. Furthermore the second edition contained four new color plate paintings; two of these illustrated spinning lures. Dr. Edgar Burke painted all the color plates in Bergman’s books, though these four new plates were his final paintings since his death occurred not long after they were completed. The third edition of Trout was published in 1978 and eventually went out-of-print sometime in the 1990’s. A paperback fourth edition was published by the Derrydale Press in 2000. The late Gary LaFontaine wrote the forward to the fourth edition and he indicated therein that Trout, with all its multiple printings and editions had sold more than 225,000 copies. This is unprecedented for a fishing book. The odd number of wet flies in this collection results from adherence to the format and curious layout of flies on the color plates of Trout. Plate one has forty-two flies and plate number eight has fifty-seven. The remaining seven plates each have four dozen flies. As I began working on my first framed reproduction set of the Bergman color plates in 2002, my intent was to include every wet fly pattern from Ray Bergman’s books. 1 The need to continue the display of flies beyond Plate No. 9 was an immediate necessity simply to include the first five wet flies listed on Plate No. 10 in Trout. Two of these flies are among the most revered of the trout fin patterns – the Fontinalis Fin and the Bergman Fontinalis. Ultimately this new, composite version of wet fly Plate No. 10 resulted from combining the remaining flies. These begin in order following the Griffen on Plate No. 10 with the patterns from Just Fishing, then move on to additional patterns from With Fly, Plug, and Bait, and conclude with the ‘new wet flies’ on Plate No. 16 from the second edition of Trout. It seemed logical to establish the number of flies for this additional frame at forty-eight. The last half-dozen or so patterns at the end of this collection were added by following Ray Bergman’s advice recorded at the end of the Plate No. 2 recipes, as follows: “Note: Many of these patterns shown in the wet plates make excellent dry flies. Because any pattern shown in color is designated as wet or dry does not mean that they may not be tied in either manner.” The final number of patterns gleaned from Bergman’s books was a handful short of four dozen flies for the tenth frame, so a few dry fly patterns such as the Adams and Female Beaverkill that were historically produced as wet flies were included. Some notes on the pattern recipes and ingredients are included here for clarification. The first change is that the left to right listing of the ingredients as presented in Trout; – body, ribbing, tip, tail, hackle, and wing; has been altered to a more functional tier-friendly sequence, listing the components in order as they are tied in during fly construction. This revised ingredient listing contains variations on specific patterns due to normal sequential tying procedure. For example, all patterns with a palmered hackle such as the Allerton or Kineo list the hackle ahead of the ribbing and body material, because a palmered hackle is ideally tied in prior to the ribbing and body material, as opposed to flies with a standard hackle, such as the Babcock or Yellow Sally, where the body and ribbing are listed first because they are tied in and wound on prior to tying in the hackle at the head of the fly. Concerning the color plates and the recipes there are various discrepancies between the fly paintings and the ingredients listed in the back of the book. Dr. Burke was extremely detail-oriented. Ray Bergman’s niece, Norma Christian, informed me all the flies were painted from actual samples. Consequently, in most cases pattern changes have been recorded in favor of the paintings. A few of these are: the Cupsuptic has an unlisted peacock herl head; the Kineo includes an unlisted silver tinsel tip; the Wilderness has an unlisted married tail; the Orange Sedge sports an unlisted orange hackle; the Saranac has an unlisted brown mallard stripe on the wing, and so on. Moreover, under the heading of ‘tip’ in the written recipes varying information is present. In numerous cases there is confusion between tips, tags, and butts. These differences are discussed in depth in two areas and notated frequently among the updated recipes and related patterns within this body of work. Wherever possible any differences between the written recipe and color plate painting have been corrected and footnoted throughout this collection. The alphabetical listing of the flies as originally published in Trout was not entirely correct. This collection presents electronically generated alphabetical revisions while keeping the flies within the color plate where they initially appeared, but within each plate grouping the computer alpha listing was given precedence by default. Also, a complete numerical listing of the flies has been added, starting on Plate No. 1, with number 1, and continues through Plate No. 10, concluding at number 483, with the numbering on each separate plate continuing in consecutive order from the last fly on the previous plate. The written recipes for married wings and tails on flies, without having an illustration or photograph to follow, are set forth by established tying traditions going back to the 19th century. A proper written order of married ingredients always lists components from the top down. Tradition primarily dictates married wing assembly from the bottom up, which is arguably the most efficient and most natural method of handling the materials. Knowing this, consider for example the tail on the Captain, originally written as scarlet and yellow; this indicates to the tier that the yellow is on the bottom with scarlet on top. Comparing the Kineo wing recipe, as written: scarlet, white, black – married; the scarlet is on top and the black is on the bottom with white in the middle. This time-honored tradition should not be changed, hence this translates to the instruction that fly tiers must read and understand that assembly of married tails and wings is in reverse order from their written sequence. Many flies on the original color plates illustrate tails of quill sections, though this was not specified in the dressings. For example, the recipe may only indicate, ‘tail – crimson.’ Quill section tails present a more striking profile on wet flies; hence, all color plate fly paintings with a quill section tail have been noted accordingly on these revised recipes, though hackle fiber tails could correctly be used in place of quill sections and vice versa. Tails written simply as ‘brown’ or ‘red’ in the recipes have been specified as hackle fibers whenever they occur, adhering to the color plate illustrations in these revisions. Much of this information is clarified by the color plate paintings, without which, the written recipes make no specification regarding tails either way. Flies may be tied with a choice of quill section or hackle fiber tails, producing attractive patterns that are technically correct either way. For example, I have seen old commercially tied versions of the Parmachene Belle with tails consisting of mixed red and white hackle fibers. This was probably an effort to keep the pattern correct while reducing production costs. Married tails not specified in the original recipes have been revised as such; nearly all married tails and wings incorporate various kinds of wing quill sections such as duck, goose, turkey, and guinea fowl. When flank feathers such as barred Mandarin are specified in a married tail, such as on the Cassard, Denison, or Holberton, goose shoulder should be used to maintain uniformity of texture with the softer flank fibers of Mandarin or wood duck. The listing of ‘slate’ for wings normally indicates the popular material of natural mallard wing quills, or some other duck with similar coloration. ‘Light slate’ simply means lighter shades of mallard flight feathers. ‘Dark slate’ can be obtained from Canada goose wings, and also teal, coot, and European blue jay have dark slate wing feathers. Bergman’s listing of ‘brown mallard’ for wings and tails is the same as what is contemporarily sold as bronze mallard. The traditional listing of brown mallard has been retained in these updated recipes. Tinsel for tips and ribbing is always assumed to be flat unless specified otherwise. When Trout was written all tinsel was real metal, nowadays tiers also have Mylar at their disposal. Mylar looks great and is non-tarnishing but is not as durable. Mylar also does not contribute additional weight to the fly like metal tinsel does, which can be a factor in fishing performance. Wet fly bodies with two parts, such as ‘rear half yellow floss, front half red floss,’ were originally written with the front ingredient listed first. For the sake of more efficient fly construction this was changed to list the rear portion of the body first, followed by the front section, since that follows the natural sequence of tying the materials. Similarly, two-part bodies may be rear half tinsel or floss, with front half dubbing, herl, or chenille. Patterns listing ‘Bittern’ or ‘pheasant’ for wings and tails can usually be substituted with the many color variations of brown turkey or peacock wing quills that are widely available. Peacock sword for wings and tails yields the best results when matched pairs of left and right feathers are used. This results in better balance and appearance on the fly. The listing of ‘silk’ as a ribbing appears on many flies. Unless specified as floss this was historically achieved with heavier tying thread or rod-winding thread. I prefer to use a single strand of floss for these silk ribs, and its application is best accomplished by twisting it into a thread-type strand before it is wound over the body. Flies with a peacock herl body and floss rib, such as the Henshall or Emma, or the Stone, with a dubbed body and silk rib, should have two strands of floss to ensure that the rib remains visible, rather than a single strand that may settle into the fullness of the body material when wound on and become less visible. A single strand of floss works perfectly as a rib on floss bodies, such as the Lord Baltimore and Last Chance. Thread may be best for silk ribbing on smaller hooks. When Trout was first published, all floss, chenille, and tying thread was manufactured from silk. Nowadays synthetic rayon and nylon have largely replaced the original silk. Recipe specifications of ‘Mandarin’ or ‘Barred Mandarin’ for wings and tails in wet fly patterns were the result of a major ecological circumstance of the wood duck. Due to decades of market hunting and wholesale loss of habitat, wood ducks were in serious decline by the early 1900’s, and were even considered by some to be on the road to extinction. This was a valid concern at the time considering the fate of the passenger pigeon. Because their primary breeding habitat was located in eastern North America where the majority of the population lived at the time, wood ducks were probably the most-hunted species of duck prior to 1918. Up until that year wood ducks were legally hunted from September to April. The Migratory Bird Treaty Act of 1918 banned the hunting of wood ducks nationwide until 1941, when their population rebounded sufficiently to permit restricted hunting once again. However, most states did not allow the resumption of wood duck hunting until 1959. Since Trout was written in 1938 at a time when wood ducks had already been under protected status for twenty-years, Mandarin duck was the only suitable plumage that could legally be used on flies such as the Catskill, Gordon, Cobler, Von Patten, and Tomah Joe, that we now more commonly use wood duck flank feathers to tie. In light of this environmental and historic significance, for posterity these recipes retain the original Mandarin specifications, even though the more readily available wood duck is predominantly used for tails and wings that originally called for Mandarin or barred Mandarin. In 1892 Mary Orvis Marbury wrote a book titled Favorite Flies and their Histories. A notable difference between the fly patterns in her book and Bergman’s Trout, written more than forty years later, in light of the aforementioned Migratory Bird Treaty Act was reflected in changes of fly ingredients. For example Bustard, wood duck as noted above, and other domestic and exotic feathers called for in some of the patterns in Marbury’s day were changed to promote the use of legally obtainable feathers in fly dressings by the time Ray Bergman wrote Trout. Another difference between Marbury’s book and Bergman’s books and the associated fly dressings shown on the color plates is the style of tying the flies. All the patterns in Favorite Flies and their Histories illustrate flies on blind-eye hooks. Also most of the dressings in Marbury’s book are larger, fuller, and often employ sections of whole feathers for wings. This was probably due to the fact that historically fish were of larger average size and more abundant, especially in remote locations like the Adirondacks, Maine, Michigan’s Upper Peninsula, Canada, and the West. In our present age, we have instant information at our fingertips. Yet it is my view that there will never be a substitute for any opportunity to relax in a comfortable chair in a cozy room on a winter night, the warmth and crackle of an open-hearth wood fire close by, with a copy of Just Fishing, Trout, or With Fly, Plug, and Bait in hand, where one can read Ray Bergman’s unassuming text, peruse Dr. Edgar Burke’s intricate color plate paintings, and pore over the historical written recipes. This is tradition, this is history, it is the past and present, and it inspires us with anticipation for the future, yet all this is only a part within a larger realm of intangible aspects for those of us who love fly fishing and fly tying. These experiences provide an almost unexplainable enjoyment and fulfillment. Ray Bergman passed away in 1967. Now it seems as if his spirit is more alive than ever. will this photo collection be for sale ? Where ? Don Bastian’s tying of Berman flies is absolutely supreme and beautifully done!! Don has also helped lots of fly tyers at the fishing shows he participates in. I have watched him for hours at the Marlboro, MA show and never tire of learning little and large tips to help my fly tying efforts. His videos are first rate; if you are serious about tying wet flies; buy them! I’m looking forward to seeing this project progress!! What a tremendous undertaking. Keep up the great work Don! Wonderful. We are really fortunate. Excellent article. Superb tying. Don’s fly tying/fly fishing knowledge and skill is amazing. Thanks for sharing! Keep it coming! 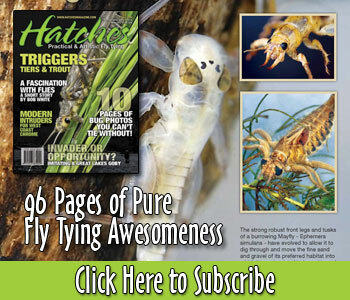 What an amazing resource for fans of Bergman’s Classic Wet flies. Thank you Don Bastian and Hatches for putting together this invaluable reference and wealth of information and tying notes. Putting the fly pattern recipes into today’s standardized tying sequence will be greatly welcomed for tyers everywhere. Like everyone else, I have tried to follow Dr. Burke’s paintings when tying Bergman’s wets, but Don’s fantastic photography of each fly will make it so much easier. Thanks Don! Will you, Hatches, send out an e-mail notice when the next set of 10 flies will be published on your web site? That would be great so we can follow along and tie the patterns as they come out. Again, thank you so much Hatches and Don Bastian for doing this. I look forward to the next set(s) and for my copy of Hatches Magazine that is coming in the mail. Thank you to everyone for placing your positive comments. I appreciate it very much! This is a labor of love for me…and I am happy there are others doing the same type of wet fly tying that I am. Mark, your question about this photo collection being for sale? And where? I haven’t thought about that at all, but yes it probably will be, but perhaps not until The Ray Bergman Collection project is complete on this site. I’m typing this next to my 2 treasured plates of Don Bastian’s wet flies from Trout. As I long-time Don Bastian groupie, I’m thrilled to see this getting posted on Hatches. Maybe when it’s all done you could put it in book form and publish it. There are certainly a bunch of us who would love to have this in permanent form. Wow, fantastic Don, can’t say enough about the collection. Now I’m going searching for the books! I consider myself a “newbie” at all of this and I can, for the most part because I haven’t come even close to married wings just yet, follow these patterns. Thanks again from the big cold country,,,,eh!!! Absolutely an unprecedented wor of art! What more can be said! I’ve been interested in the works of Mr. Bergman ever since an article appeared in FLY TYER magazine. I’ve been able to collect all of the books listed in the above work. I feel very privileged to have these and others (Freshwater Bass) and I guess since I’m a newbie to tying these seemed like the guys that set the standard and gave all of us some really great pieces of work to look at–I have to include one other thing Mr. Bergman and my late uncle were one in the same and could have passed as his twin–KEEP FISHING! I grew up fishing wet flies, and still fish them more than anyone I know. As a Fly Fishing Guide I have introduced many anglers to the joys of wet fly fishing. Wets are simple to fish but so effective and yet cover the while spectrum of complications experienced by anglers even today. Thanks for the great work, I would love to see the whole collection! Being a tyer of lofty dreams and limited talent. I deeply appreciate a master tyer’s efforts. Be it on the web, DVD, magazine, book, or in person. Don’s efforts are superb. A joy to behold. Thank you many times over. Absolutely beautiful work. I have not seen anything indicating what size and type of hook you are using, or does it depend on the pattern? I’m really looking forward to seeing more. Thanks so much for your compliments! The hook sizes are not listed; I have a 1935 Weber Catalog – the wet flies were sold by that company in stock sizes of #4 to 12, with a notation that “other sizes available by special order.” Bergman in Trout indicated his hook sizes for most wet fly fishing were in the same range, usually # 6 – #10. When will we get more of Don’s great work … Simply superb – but admittedly a long way to go. I asked why there has been a delay on these flies…Will Mullis replied that he’s in the middle of moving and is extremely busy with many things going on. Another ten flies were just added to the Collection, and hopefully the pace of them being posted will speed up a little more from now on. Thanks for your interest and appreciation of my work! Thanks to a dear friend of mine who is a book collector I own copies of all Ray Bergman’s books, they occupy a prominent shelf on my bookcase next to my tying desk. I tie Bergman’s flys, fish Bergman’s flys and put them in shadow boxes for clients and friends. Thanks for your labour of love to create this body of work. It will be treasured forever. Thanks again. I will be buying the finished product. Thanks for your comment and compliment, I appreciate it very much! Glad to hear of a reader who enjoys Ray Bergman’s books and tying traditional wet flies. Thanks for your appreciation! Reviewing all of the comments I believe we have a group of guys who are greatful to Don and Ray. This is definitely a labor of love and to echo what others have said can’t say enough, from the Hatches media source to contributors I too look forward to my weekly dose and dig through all of the info, from reading the original classics on fishing to the current fraternity what can one say “just can’t get enough” to all a big Thank You and keep up the excellent work to carry on these true traditions. Your work is absolutely incredible. I once met you at the Fly Show at the University of Maryland. You are such a gentlemen. I purchased your DVD and I brought another one I ran across later. I love wet flies and their history. Please keep up the great work. I hope you will have other DVD’s for sale in the future. I never got a chance to purchase your book but I was told it was amazing.I hope you will write other books on wet flies sometime in the future. Thank you for sharing your gift with us. I apologize for not seeing your comments sooner, especially you, Steve. The first six months of the year are especially busy for me, so my apologies. Thank you so much for your kind words of support! This project and my continued tying of a variety of classic flies is my passion. Thank you for your endorsement! Mike; I thank you for your purchase and hope we’ll meet again one day. I’ll be at Great Feathers Fly Shop for classes in Sparks, Maryland, this coming October. Rumors of my “book” are wildly exaggerated, at least I have not yet published a book. Working on one though, The Favorite Flies of Mary Orvis Marbury, which will be a tier-friendly volume with photos, printed recipes, and recreations of all 291 19th century Orvis fly patterns tied by myself and twenty-odd contributing tiers. Plus, there will be recipes for an additional 100 or more flies, including a few dozen previously unpublished dressings. Thank you both for your compliments and kind comments. I appreciate it very much! I bought a first edition of Trout in 2001 by Bergman from a book dealer. There is no jacket and the spine is worn significantly on the corners. I forgot it had Bergman (commercial) nylon leader in it. In addition it has two actual flies between the pages: at Plate #13 has a Honey Dun and Plate 12 a black streamer. I wonder if Ray tied them. I noticed in your presentation wet flies from trout you sometimes use a bearded hackle and sometimes a collar hackle, even if the Burke painting is a bearded hackle, what lead you to the use of a collar in your Hatches presentation flies?